Asked to intervene, the Ministry of Defence (MoD) backed Ladbrokes, saying there was no evidence of alien visits. In early 1990, the man, from Beeston, Leeds, who is not named in the files, placed a successful £2 bet on West Germany winning the 1990 World Cup at 6/1. 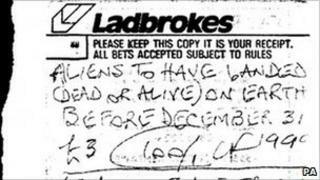 His £12 winnings along with his original £2 stake were added to a £3 wager on "aliens to have landed (dead or alive) on Earth before December 31 1999" at 100/1, meaning he stood to win £1,700 if extraterrestrials were found. The bet was placed at the Lower Briggate branch of Ladbrokes' in Leeds. But Ladbrokes refused to pay out, writing to the punter in April 1999: "We advise that at present your bet is not a winner as the United Nations, who we use as our source of authenticity, has not yet confirmed the existence of aliens. "However, as the bet stipulates 'before December 31 1999', should the United Nations confirm this before that date we will be only too pleased to make payment to you." The punter made a complaint "as a last resort" to the minister for sport, which was passed to the MoD. He said he had found 19 books in Leeds Central Library reporting the famous Roswell incident, in which an alien spaceship was reported to have crashed in New Mexico in the US in July 1947. He wrote: "I placed my bet on facts, Ladbrokes hide behind government propaganda weighted heavily to prevent public alarm and panic. "Which I agree with it [sic]. I do not want the media reporting my wager, but I should be paid out. My bet is a winner." An MoD official replied on 23 July 1999: "The MoD does not have any expertise in respect of UFO matters or to the question of the existence of extraterrestrial life forms, about which it remains totally open-minded. "However, to date the MoD is not aware of any evidence that might substantiate the existence of alien life forms and therefore supports the view that your bet should not be upheld."